Practical Aviation Security 3rd Edition is now available! 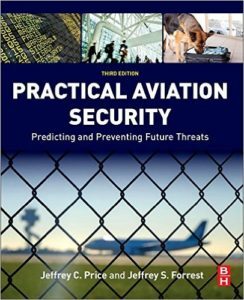 The 3rd edition of Practical Aviation Security: Predicting and Preventing Future Threats in addition to bringing the text up-to-date with current industry practices, there are new sections addressing: intelligence and interdiction, security operations and airport policing, terrorism and counter-terrorism strategies. All of these are designed to keep you and students up to date with the latest information in aviation security. Practical Aviation Security – 3rd Edition, slide decks, a test bank and instructors guide are available through the publisher, Elsevier. Practical Aviation Security – 3rd Edition, hardback or paperback, is available on Amazon. “Practical Airport Operations (2016)”, continues to be my #1 reference to adequately address the different hats I’ve worn in the Aerospace Industry and Airport OPS. ” See other reviews on Amazon! Real Information – Practical Aviation Security is a complete guide to the aviation security system, from crucial historical events, to the policies and policy makers and the major terrorist and criminal acts that have shaped the procedures in use today, to the tip-of-the-spear technologies that are shaping the future. The 3rd edition of Practical Aviation Security: Predicting and Preventing Future Threats enables the reader to enter airport security or other aviation management roles with the proper knowledge to immediately implement the necessary security programs, to meet international guidelines and to responsibly protect their facility or organization, no matter how large or small.Using case studies and practical security measures in use at airports all over the world, readers learn the effective methods and the fundamental principles involved in designing and implementing a security system. This text covers commercial airport security, general aviation and cargo operations, threats and threat detection and response systems as well as international security issues.While not perfect, the aviation security system is comprehensive and requires continual focus and attention to be able to stay a step ahead of the next attack. This text provides the tools necessary to prepare practitioners to enter the industry, and if they are already in the industry to better understand it so they can prevent the next tragedy.